U.S. Army Spc. 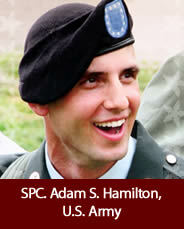 Adam S. Hamilton, 22, of Kent was killed on May 28, 2011 in Haji Ruf Afghanistan from injuries sustained from an improvised explosive device (IED) after his unit was attacked while on a night mission. He was assigned to the 4th Squadron, 4th Cavalry Regiment, 1st Brigade Combat Team, 1st Infantry Division, Fort Riley, Kansas. Adam was one of the top marksmen in his unit and was assigned as a sniper. While growing up, Adam was a gifted athlete. In high school, Adam was a four-year starter in lacrosse and hockey, playing football his senior year. Adam holds many records in Kent Roosevelt’s hockey program with a career scoring record, netting over 100 goals. In football, in his first and only season, Adam was named All PTC Conference as a tight end and also played outside linebacker. Adam was a natural-born leader and warrior on the lacrosse field. Adam captioned Roosevelt’s 2007 lacrosse team in their lowest state ranked season, earning All America Honors. He led the state and set a school record for assists his senior year with 52 and led the team in winning loose ground balls. He was also named Offensive Player of the Year in Northeast Ohio that year. Adam was second on the team in scoring as a sophomore leading Roosevelt to the State Championship game in Division 1B. Adam was best known for his determination and heart and was respected by all who witnessed his gritty determination. There are several awards and scholarships given in Adam’s name each year including the Adam S. Hamilton Academic/Athletic Scholarship, Adam S. Hamilton Player of the Year Award North Coast Ohio Chapter of US Lacrosse, and the Adam S. Hamilton Kent Roosevelt Hockey Player of the Year Award. On one of Adam’s last trips home before going to Afghanistan, he visited the locker room of the Kent Roosevelt hockey team to speak to the players before a game. Some of the players on the team had played with Adam during his high school career and one special player grew up admiring Adam and his skill and love for the games of hockey and lacrosse. Adam delivered the following speech that will never be forgotten by the players and coaches present and is used by current coaches to address players: “One thing you have to always remember is you all are a family. Every time you put on that jersey you look out for one another. Great teams are structured with great relationships on the ice, on the bench, and in the locker room. Life moves by fast men, but one thing you will always have are the brothers next to you.” Adam not only felt that way about the sports he played, but the life that he chose. He always loved belonging to and working with a “team”. He looked at his unit as his family and every time he put on his uniform he looked out for his country, his family. His life did move by too fast, but the one thing he always had was the brothers (family) next to him. He truly did live by his words. To Adam, “family” was his most important “mission”.